For hundreds of years, Grand Rapids creators have built and maintained unique properties; whether home to influential people or a marvel of design themselves, these are 10 of the most interesting homes in Grand Rapids. In a city of designers, furniture manufacturers, and architects, the homes reflect the creative and ambitious minds that live within. For almost two-hundred years, Grand Rapids creators have built and maintained unique properties; whether home to influential people or a marvel of design themselves, these are 10 of the most interesting homes in Grand Rapids. Cleverly tucked away just steps from bustling Lake Drive is the Freeman House, a mid-century modern home with an eye-catching design that forces the eye upward toward its unique, angled roof. "The design of the house demonstrates Mr. Birkerts’ ability to explore unconventional solutions to the programmatic requirements of his creative, risk-taking clients. In his fascination with the concept of superimposing an orthogonal over a radial planning grid, the architect designed a plan in which the atrium becomes the point in the building from which all other interior spaces radiate at different angles." Allowing light to flow into almost every space of the house while rich foliage cradles the property and its outdoor spaces, this home — as a truism to mid-century style — fits right into its natural, green setting. 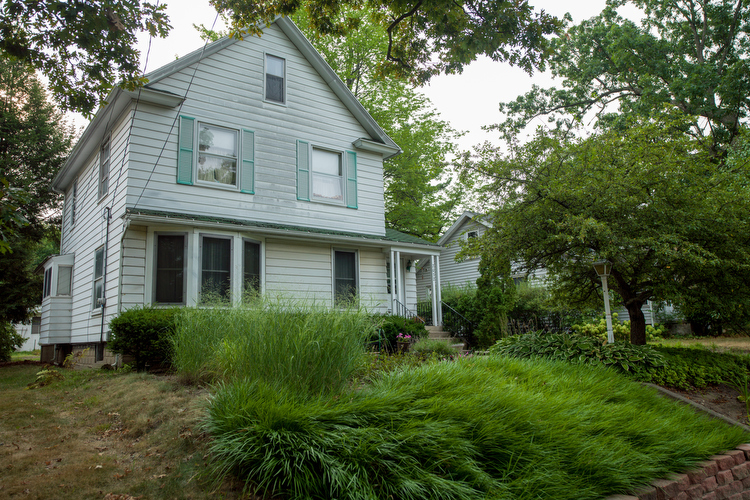 While the Gerald R. Ford Presidential Library & Museum holds much of the city's treasures from the life of our nation's 38th president, Grand Rapids is also fortunate to house a number of homes in which a young Gerry Ford spent the majority of his childhood. Donald Holloway, Curator for the Museum says, "Though his parents rented the house, young Ford lived in it from third grade through 11th grade, formative years for a child." "Here they would stay for seven years, and Junior would remember it as the home of his youth," Holloway writes in historical materials for the museum. "This is the home he returned to after Boy Scout camps and football practices, where he played with brother Tom, and where the family welcomed the arrivals of brothers Richard and Jim. What children learn of life between 4th grade and their Junior year, young Ford learned here." This house will surprise you. Grouped neatly with an unassuming yet equally stunning group of mid-century houses visible from E. Fulton lies 24 Fultonwood, a slate gray ranch with a bright and inviting green door. 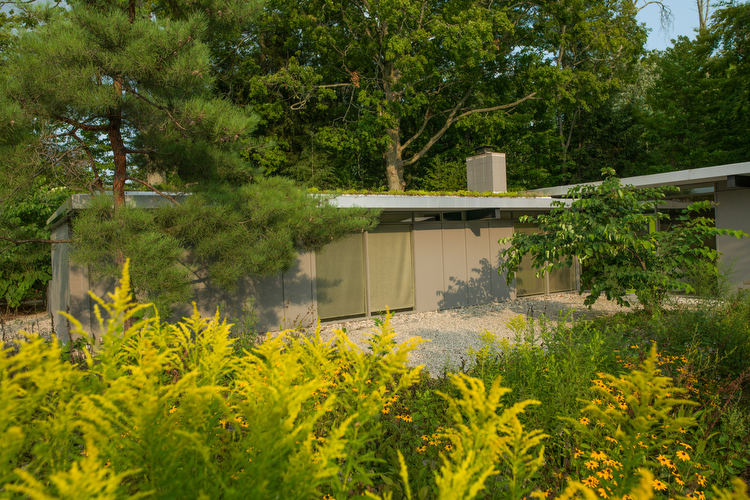 One of seven houses designed by James Bronkema in this cul-de-sac, this particular home stands out due to its thriving green roof and the clean lines that border an offset angle to the road. According to Pamela VanderPloeg, founder of the sites Grand Rapids Buildings and West Michigan Modern, "At age 25, the youngest President of Grand Rapids Home Builders, Bronkema brought the new California ranch style to Grand Rapids and Muskegon. 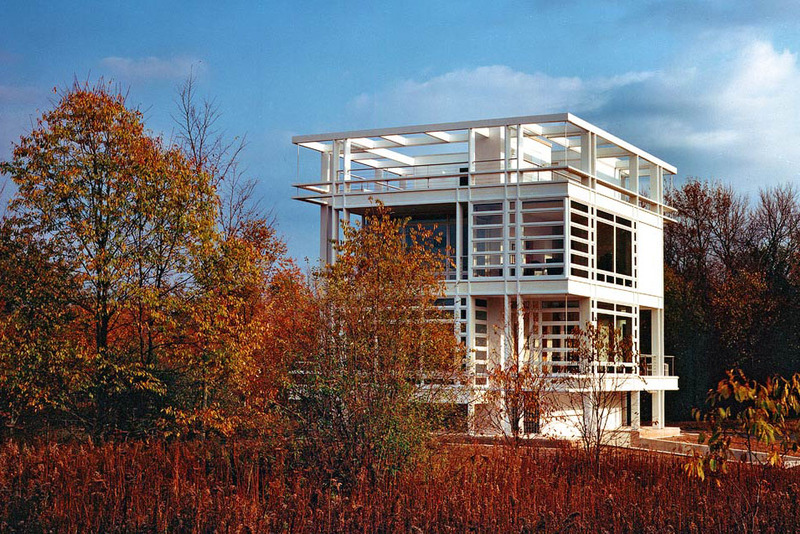 From 1945 - 1960, he designed upwards of 150 homes throughout Grand Rapids and Muskegon." She goes on to describe all of the homes in this particular grouping. "… They featured Chicago brick floors, built-in desks and dressers, wood paneled walls and glass curtain walls to bring the outside in. 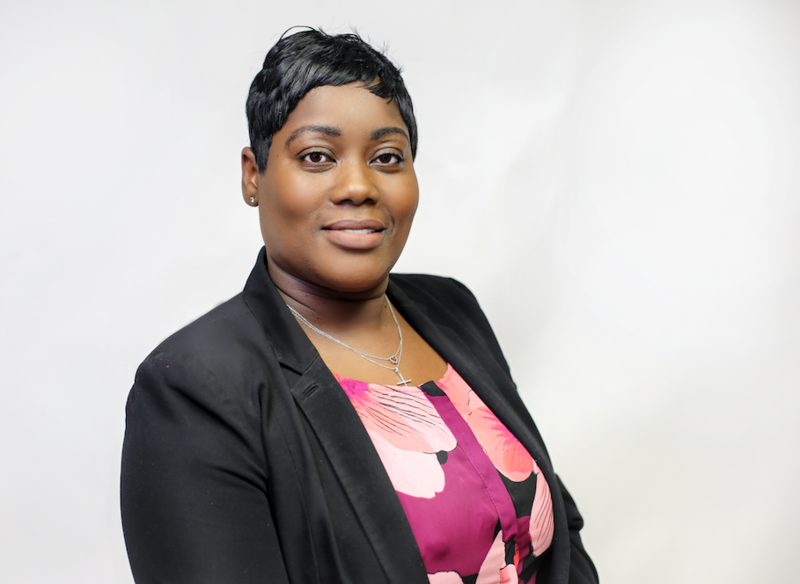 Bronkema believed in the new concept of the family room to bring families together." Stunning interior photos of the property can be found at Mid-Century Michigan. Located in the Baxter neighborhood of Grand Rapids, 427 James was purchased by the Grand Rapids Study Club in 1935 and served as their headquarters until some time around the turn of the last century. Formed in 1901, "The Grand Rapids Study Club is one of the oldest African American women's organizations in Michigan." 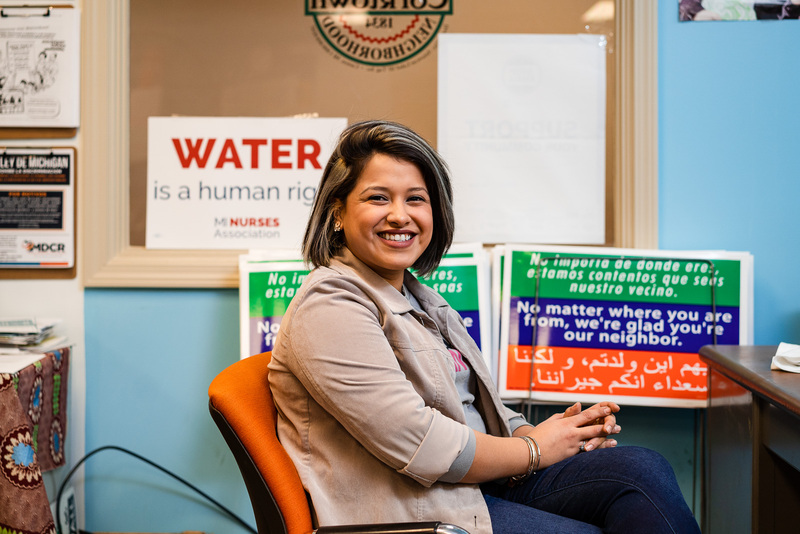 At first meeting in its members' homes, the club would meet each week to discuss current events, politics, government, culture, and many other issues. 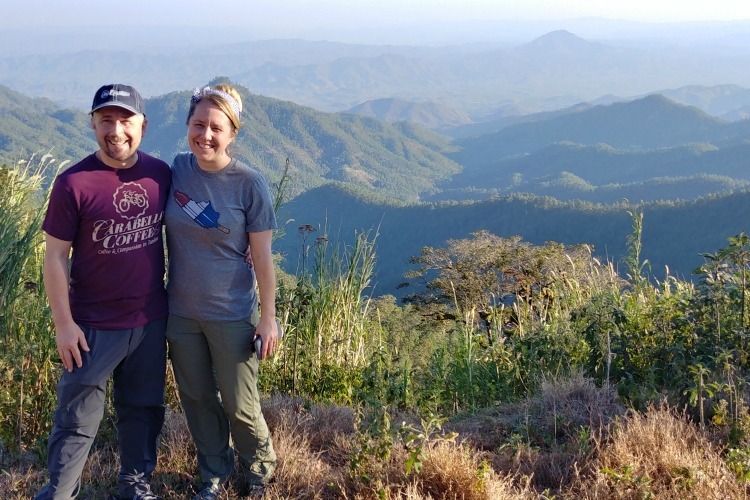 Still an operating organization, the Study Club was formed "to unite all efforts towards individual, home and community betterment through study and civic cooperation in all things which portends the advancement of all groups," according to their website. Having sponsored visits from notable writers like Langston Hughes and Louis Lomax, the women of the study club were devoted to a mission of knowledge, progress, and community. 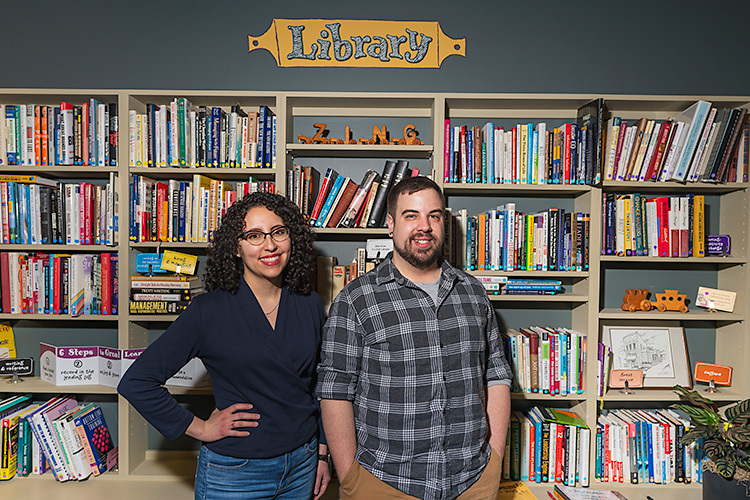 Though the Grand Rapids Study Club has since sold 427 James, the group continues to hold monthly meetings at the Fair Housing Center of West Michigan office at 20 Hall Street SE. 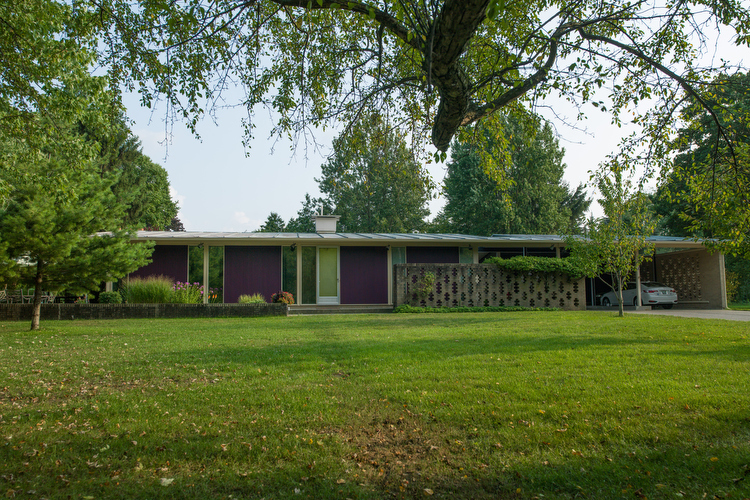 Somewhat of a departure from post-war boxes, open mid-century ranches, and grand Victorian homes that dot Grand Rapids is this mid 1990s house designed by the German American architect, Dirk Lohan, the grandson of modernist architect Ludwig Mies van der Rohe. "The house is a perfect 42 foot cube," according to Wight & Company, the firm for which Lohan currently serves as principal (Lohan designed the Devon house before his former firm, Lohan Anderson (Lohan Associates) joined with Wight). "The staggered exterior elevations faithfully express the interior’s complex plan. The heavy timber structure is painted white, with clear glass, glass block, and white clapboard siding infill." These types of materials — clear glass, glass block, etc. — may conjure images of 1990s design, but they also adhere to van der Rohe's style of clean, minimalist, and modern materials. Just a short drive out to Ada will reveal this modern, cube-shaped gem, even though it is hidden from the street in a "Mondrianesque contrast" to its wooded environment. 2536 Michigan - The "Alcoa Carefree Home"
"Intended as a showcase piece for the Aluminum Company of America, the Alcoa Care Free home was a collaborative project exploring new uses of aluminum in home building, through what Alcoa dubbed in their sales brochure as the 'greatest change in residential building materials in centuries.'" Characterized by its signature purple door, breezy, walk-through design and the "GE Wonder Kitchen," this Alcoa Carefree Home is owned and inhabited by Jon Czerana and Lissa Engleman, the minds behind Wit & Craft, a creative services agency. "We've made a big effort to not make any big changes to the house, and we're keeping it as true to its original form as possible," says Czerana. Though he notes that the Carefree Home's rollout to the country "failed miserably," the well-kept property remains a showpiece of transformative, mid-century design. 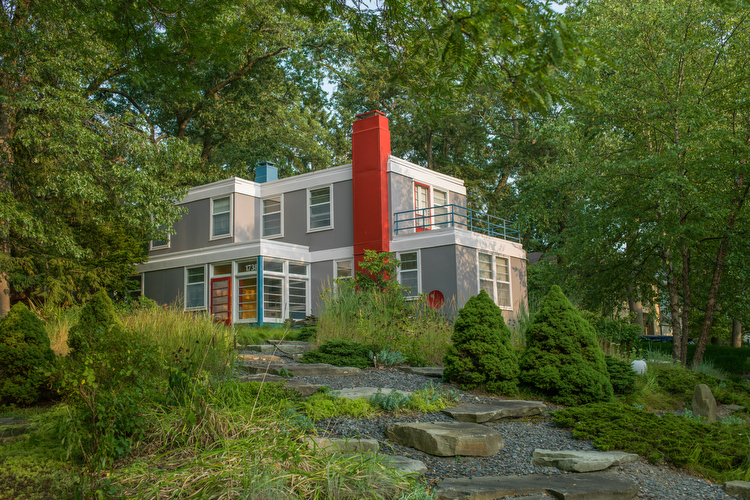 "We're architecturally rich and I don't think people appreciate that," says Czerana, who takes advantage of opportunities — like the GRAM's recent mid-century modern exhibit — to showcase the unique and historic architecture of his home. Nestled in a quite, residential area of post-war homes on Grand Rapids' northeast side, this historic Coit house can easily go unnoticed. 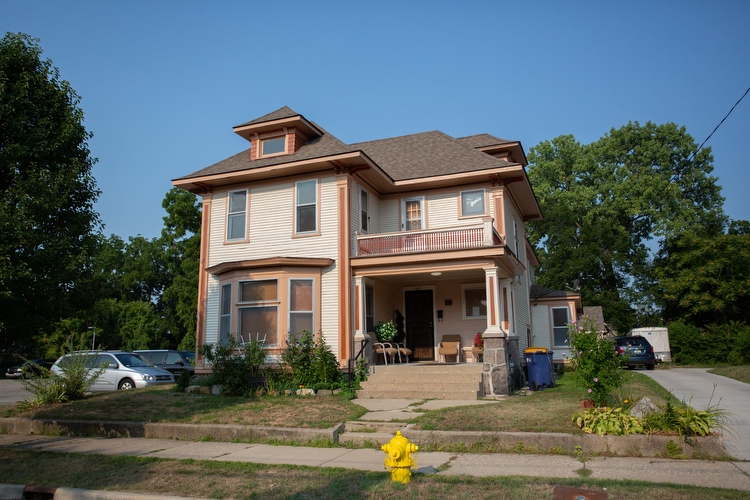 The home was purchased by Dr. Robert and Helen Claytor, who "bought it in 1944 at a time when almost no African Americans could move out of the southeast side," according to Manager, Grand Rapids History & Special Collections Julie Tabberer. Helen Claytor, whose statue was dedicated in July 2014 in the GRCC Juan Olivarez Student Plaza, was a civil rights activist who became the first African American president of the YWCA. Her son, Roger Wilkins, also lived with her at the Coit property, himself became a nationally known figure in the civil rights movement as well, serving as Assistant Attorney General in the Lyndon B. Johnson administration and later contributed to the Pulitzer prize-winning writings about the Watergate scandal for the New York Times. 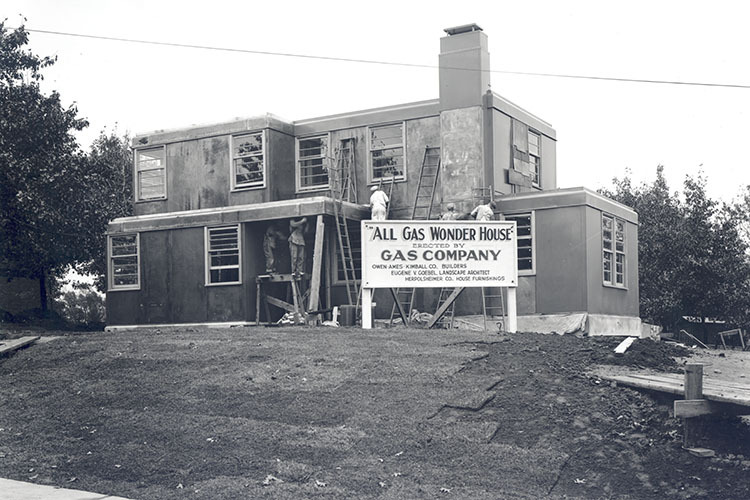 In 1930s, when the majority of American homes relied upon wood-burning stoves and fireplaces, the use of gas in all of the appliances in a residential home was a profound accomplishment. Thus, when 1738 Alexander was inspired by the 1933 Chicago World's Fair "House of the Future" exhibit and completed in 1937, it was a site to see. "People came in droves to see it," says VanderPloeg. " Naturally, all the appliances and systems were gas and it was quite revolutionary." 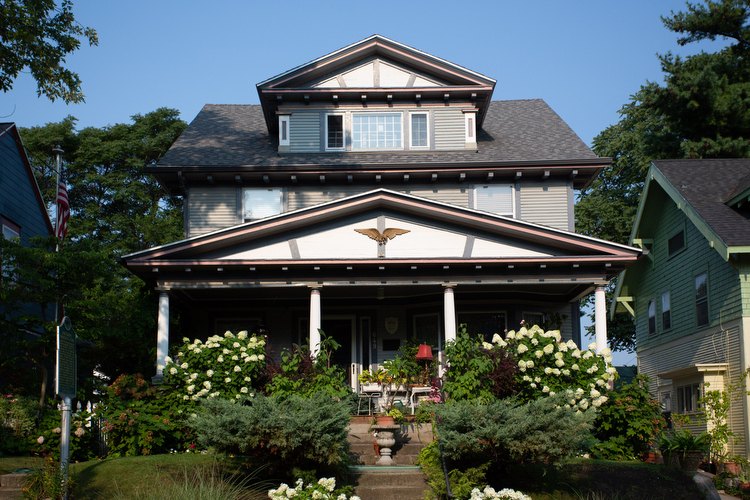 At the corner of Alexander and Cambridge, this East Grand Rapids home makes quite an impression from the street, and even though it has since been neatly cushioned by neighboring properties, this All Gas House is still a wonder. This 1906 home "is tucked into a residential neighborhood and is a surprise when you find it," says Tabberer. "It has massive pillars that would have overlooked the Grand River before the neighborhood around it was developed." "The career of Clara Comstock Russell, otherwise Mrs. Huntley Russell of Comstock Park, is closely interwoven with the cultural history of Grand Rapids. Following her marriage she became a leader in Grand Rapids women‘s activities and pioneered for their advancement. Her endeavors led her far into state and national political life. She was active in the group of women largely responsible for the eventual passing of the amendment to the state constitution permitting women to vote in Michigan. She spent time, effort, and unchronicled personal funds in the suffrage movement." Comstock Russell served as the president of the local Ladies' Literary Club, first vice-president of the State Equal Suffrage association, and president of the Grand Rapids Equal Franchise club. Her achievements were both political and tangible. Together with her sister Etta Boltwood, Comstock Russell donated the 40 acres of land that would become Riverside Park. For the house that needs no introduction, here is a short one. 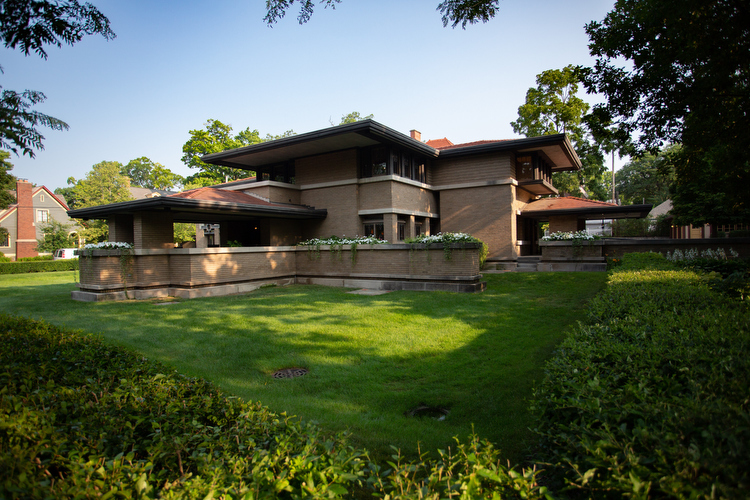 Built in 1909, the house was designed by the most famous Prarie School architect, Frank Lloyd Wright, for Meyer May and his family. Expertly crafted using Wright's design principles, each element of the home — including the fixtures and furniture — were designed by the infamously particular architect. So in the 1960s when the home was split to serve as a multi-family rental home, the architecture community suffered somewhat of a tragedy. Luckily, Frank Lloyd Wright had developed a relationship with Grand Rapids native company Steelcase in the 1930s as part of the S.C. Johnson project to develop new modular desks and chairs. Wright formed a friendship with David Hunting, Sr., who — decades later — suggested that Steelcase both purchase and restore the Meyer May House. The company finalized its purchase in 1985 and finished the restoration in 1987. "After months of interviews and intensive study of reference materials, work began to restore the interior and exterior to its original design. The restoration took two years. The work included removal of a 1922 addition, rebuilding the roof to restore its cantilevered design, replacing all the plaster ceilings, restoring a Niedecken mural under six layers of paint, cleaning and repairing more than 100 art glass windows and skylights, completely recreating the interior with original pieces and exacting reproductions, and recreating the landscape to its 1909 design." 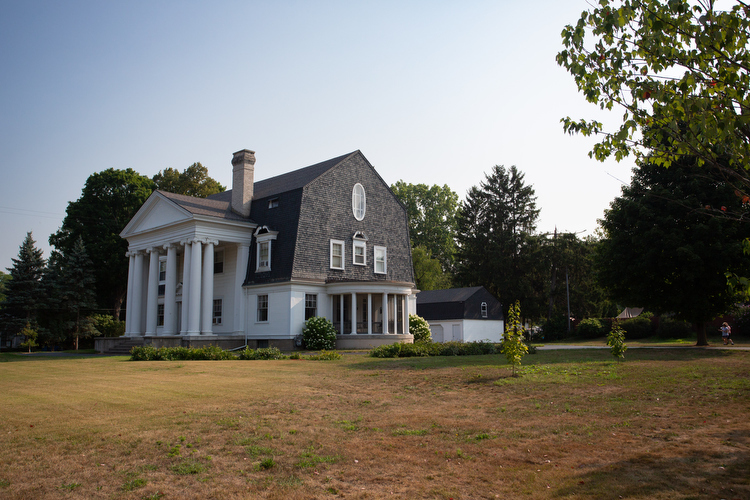 Free tours of the Meyer May House are available on Sundays from 1-4 p.m., and on Tuesdays and Thursdays from 10 a.m. to 1 p.m.
Grand Rapids is home to many stunning and historically significant residences, and we unfortunately couldn't list them all. Have a home that you'd like us to cover? Comment below or email us at info@rapidgrowthmedia.com. If we receive enough entries, we may go for round two! Special thanks to: Donald Holloway, Curator for the Gerald R. Ford Presidential Library & Museum; Pamela VanderPloeg, founder of the sites grandrapidsbuildings.com and wmmodern.com; Dirk Lohan and Wight & Company; Liz Keegan of the Grand Rapids Study Club; Jon Czerana and Lissa Engleman; Julie Tabberer, Manager, Grand Rapids History & Special Collections; Mid-century Michigan; Michigan Modern; the Grand Rapids Historical Commission; the Grand Rapids Public Museum; Matthew Ellis, City Archives Assistant; Mark Miller, DGRI Managing Director of Planning & Design; Eric Biller, AIA, LEED AP, CDT, AIA Michigan Director, Progressive AE; and the Meyer May House. Photos by Adam Bird of Bird + Bird Studio unless otherwise stated.